For ither uises, see Tuzla (disambiguation). Tuzla is a ceety an municipality in Bosnie an Herzegovinae. At the time o the 1991 census, it haed 83,770 indwallers, while the municipality 131,318. Takin the influx o refugees intae accoont, the ceety is currently estimatit tae hae 174,558 indwallers. 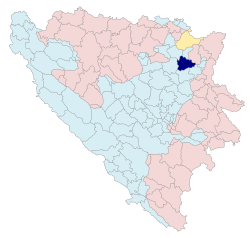 Efter Sarajevo, an Banja Luka, Tuzla is the third lairgest ceety in Bosnie an Herzegovinae, an the seat o the Tuzla Canton an Tuzla Municipality. The name "Tuzla" is the Turkis wird for salt mine, an refers tae the extensive salt deposits foond unnerneath the ceety. The ceety o Tuzla haes Europe's anerlie salt lake as pairt o its central pairk an an' a' haes aroond 100,000 fowk visitin its shores ivery year. The history o the toun Tuzla goes back tae 1510 when Tuzla wis a Turkis garrison toun. Durin the 19t century it passed unner the rule o the Austro-Hungarie Empire, an wis incorporatit intae Yugoslavie in 1918. Tuzla is locatit in the northeastren pairt o Bosnie, settled juist unnerneath the Majevica moontain range, on the Jala river. The central zone lies in an east-wast orientit plain, wi residential auries in the north an sooth o the ceety locatit on the Ilinčica, Kicelj an Gradina hills. The climate is moderate continental. Thare are abundant coal deposits in the region aroond Tuzla. 6 coal mines continue tae operate aroond the ceety. Hintle o the coal mined in the aurie is uised tae pouer the Tuzla Pouer Plant, which is the lairgest pouer plant in Bosnie an Herzegovinae. ↑ "World Weather Information Service – Tuzla". United Nations. Retrieved 20 January 2011. Wikimedia Commons haes media relatit tae Tuzla.